Wednesday night was the first episode of Season 5 of Dragons’ Den on CBC, and it was fantastic. Also called the Celebrity Episode, 3 well-known TV celebrities were on hand to endorse great business ideas. For fashion, there was Jeanne Beker from fashion television. Mike Holmes was there to check out the tools (and inform one Den hopeful that she better make sure her liability insurance is paid up). Debbie Travis, a well known expert in home decorating, was there to check out the Kelvin.23, the subject of this post. 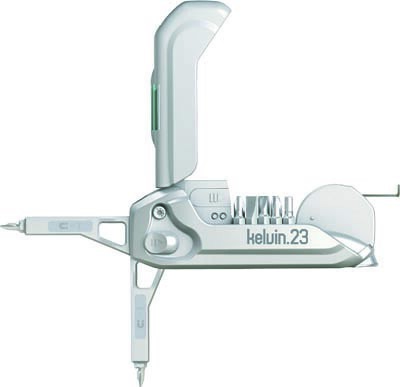 With 23 essential features integrated into this one compact design, kelvin.23 is ideal for anybody in need of a quick fix. It hammers, screws, measures, levels and even shines a bright light when you need it most. Made from cast aluminum, zinc, carbon steel and ABS plastic…kelvin.23 is built to last. The deal Kevin was asking for was $200,000 for 10% – and he had $250,000 in sales during the preceding 6 months prior to the filming of the show to back up his $2 million valuation. The first Dragon to decline was Kevin O’Leary on account of the initial description of what the money was to be spent on – manufacturing. There’s risk in manufacturing that Kevin O’Leary felt was not intrinsic to the business. While further questioning of Kevin Royes revealed that he intended not to set up a factory, but to directly negotiate the manufacturing process, Kevin O’Leary remained out. Jim Treliving, however, saw a bargain at $200,000 for a solid business, and offered his money. When Arlene Dickinson asked to go in on the deal, Jim balked, and so Arlene made the same offer on her own. Robert Herjevac offered to match Jim’s offer in conjunction with Jim (that is, combined at $400,000) for 25% of the company, and Arlene joined the partnered bid. With three of the Dragons vying for a piece of his company, Kevin Royes stepped out for a quick consultation with his wife and his marketer for the U.K. On his return, he countered with an offer for $500,000 for 25%, which, after some brief discussion, was accepted by all three. This was someone who played his cards well. Kevin had a solid business, impressed Debbie Travis, who would then feature the product on her show and record an infomercial as part of the deal. He had sales to back up his valuation, putting him in a strong bargaining position. But most of all, he impressed the Dragons as soon as he did his demo. At that point, they were interested in investing, and he could stick to his valuation, and they would pay for it. Tagged with: Arlene Dickinson, business, CBC, deal, Debbie Travis, dragons den, entrepreneur, Jeanne Beker, Jim Treliving, Kelvin.23, Kevin O'Leary, Kevin Royes, Mike Holmes, Robert Herjavec.